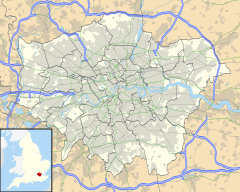 Penge (/pɛndʒ/) is a district of south-east London, in the London Borough of Bromley. Penge was once a small town, which was recorded under the name Penceat in an Anglo-Saxon deed dating from 957. Most historians believe the name of the town is derived from the Celtic word Penceat, which means 'edge of wood' and refers to the fact that the surrounding area was once covered in a dense forest. The original Celtic words of which the name was composed referred to 'pen' ('head'), as in the Welsh 'pen', and 'ceat' ('wood'), similar to the Welsh 'coed', as in the name of the town of Pencoed in Wales. By 1862, Stanford's map of London and its Suburbs shows large homes had been constructed along Penge New Road (now Crystal Palace Park Road, Sydenham and Penge High Street), Thick Wood (now Thicket) Road and Anerley Road. This all came to an end in 1875 and 1877, with the notorious Penge murders. In 1875 Frederick Hunt murdered his wife and children, then in 1877 a wealthy heiress, Harriet Staunton, together with her infant son, was starved to death by her husband and his associates. In 1934, Elizabeth Jenkins published the novel Harriet, based on the case, whilst Forbes Road was renamed to Mosslea Road because of its connection with the murders. The police station at the corner of the High Street and Green Lane is believed to have been London's oldest working police station when it was closed in 2010. Penge is served by three rail stations. Penge East and Kent House have frequent Southeastern services to London Victoria, Bromley South and Orpington. There is also Penge West, which has services to London Bridge and Caterham, as well as London Overground services to Dalston Junction/Highbury & Islington and West Croydon. St John the Evangelist's Church, Penge (pictured right) Beckenham Road, built 1850 to designs by Edwin Nash & J. N. Round Penge Congregational Church, built 1912 to designs by P. Morley Horder with passage aisles and clerestory. Shafts on large, excellently carved corbels. and has a stained glass window by William Morris. Crystal Palace Park contains the National Sports Centre, which includes an international-class athletic stadium, and a former motorsport circuit that was used in the 1969 film The Italian Job. The Crystal Palace Park once housed a football ground, which hosted the FA Cup final from 1895 to 1914, as well as London County Cricket Club games from 1900 to 1908, when the club folded, and Crystal Palace FC's matches from their formation in 1905 until the club was forced to relocate during the First World War. Other facilities include Alexandra Recreation Ground, Penge Recreation Ground and Royston Playing Fields. There is a municipal golf course across the borough boundary in Beckenham Place Park. After the Crystal Palace was moved to Penge Place, a fashionable day out was to visit the Crystal Palace during the day and to take the tram down the hill to one of the 'twenty-five pubs to the square mile' or two Music Halls. Joseph Petrus Hendrik Crowe, Victoria Cross recipient, died at Penge in 1876. ^ "familygrowsontrees.com - familygrowsontrees Resources and Information". ww1.familygrowsontrees.com. ^ Rachel Cooke (15 April 2012). "The Penge Mystery: the terrible story of Harriet Staunton". The Observer. Retrieved 8 March 2014.